I've tried all the streaming music services at one time or another, beginning with Rhapsody in 2002. My all-time favorite music service was Lala, which was purchased by Apple in December 2009 and shortly thereafter shut down. So much for competition. I'm a daily user of MOG (the better, American answer to Spotify), Pandora a lot less often than I used to, and Tune In when I'm looking for terrestrial radio. Of course, I also use my phone and various iPods to listen to music I've purchased from Apple, eMusic and Amazon. No matter how I listen to my music, there is one music app/service that is always at work, always running in the background. It's been around for 11 years, has over 50 million users worldwide, yet commands just 2% of music streaming usage according to a recent study, which is a real shame. I often mention this app to friends, and I'm still amazed how many have either: 1) never heard of it, or 2) know of it, but not what it does. If you haven't guessed yet, I'm speaking of Last.fm, THE one music app+service every music lover and festival freak should be using. Last.fm is streaming radio, like Pandora, only better. Last.fm has a social component, like Spotify, only it's not tied to Facebook. 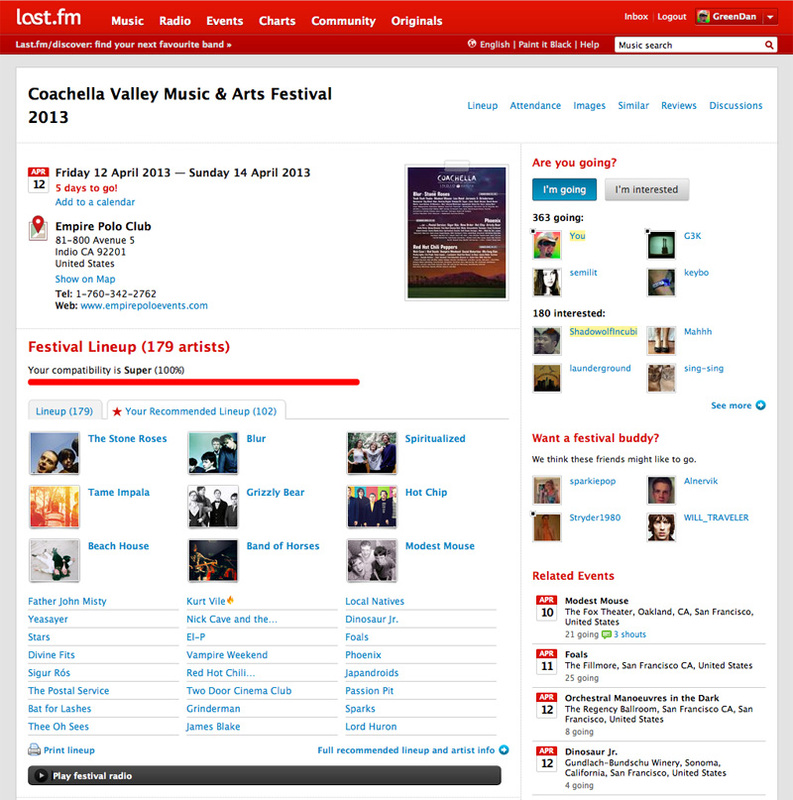 Last.fm tracks the live shows you attend and suggests upcoming ones, like Songkick and Bandsintown. But the best, killer feature of Last.fm is scrobbling, a made-up word that means whenever and however you listen to music, it's added to your Last.fm library. Your Last.fm Library is something like your personal music collection on Last.fm – this is where you can view and manage all artists, albums and tracks you have ever added to your profile, as well as your loved tracks, any playlists you have created and all the tags you have used. Items are automatically added to your Library when you scrobble, love or tag them, or add them to any of your playlists. Alternatively, you can also add items manually by clicking on the "+" button on artist, album, or track pages (next to Play Radio) where available on the website. Seed your Last.fm account with artists and tracks you love. 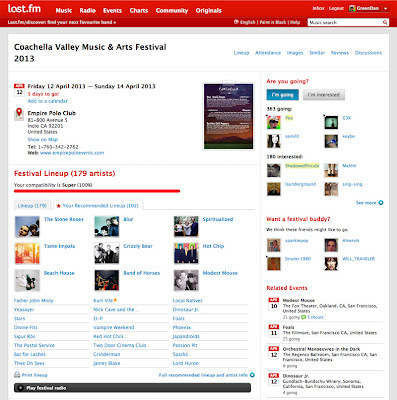 Add Coachella to your upcoming events, then see which artists Last.fm recommends.